Safety and security are critical for warehouses and other industrial facilities. Many times, safety means controlling access to your facility and keeping unauthorized people out of areas where they aren’t allowed. Industrial-strength folding gates make your facilities more secure, but allow frequent, easy access to those who need it. Whether it’s a doorway, hallway, or loading dock, folding gates make warehouses safer. Let’s dive into it. 1. Secure an area with no infrastructure changes. When it comes to securing a space in the warehouse, there’s no shortage of options. However, folding gates are ideal for dock doors, which are frequently open for daily operations. They are inexpensive, effective, and can be installed quickly without major changes to existing infrastructure. 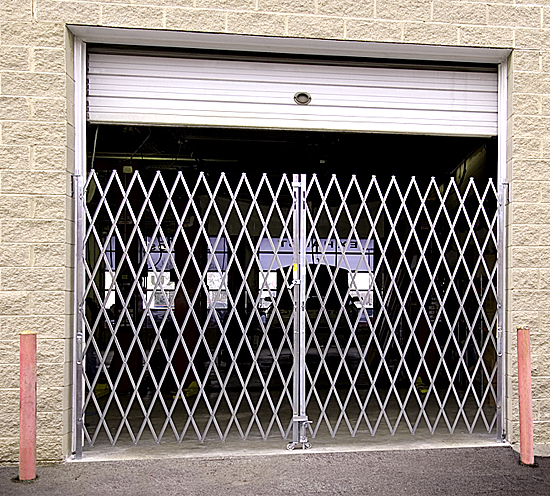 Whether it’s a folding gate for a loading dock, garage, or doorway, they provide a simple, yet secure barrier that can restrict access to a given area. They don’t get in the way like some of the other options, and can easily be opened or closed when a truck comes to your dock area. The hardware and collapsed gates occupy little space on the side of the door frame and pivot out of the way when open. 2. Prevent theft, vandalism and unauthorized entry. Folding gates have long been employed by storefronts as a way to deter graffiti artists and vandals, as well as provide an additional security measure against theft. Implemented in a warehouse, folding gates do the same thing. They are an affordable and painless way to increase security. In addition to larger dock door gates, smaller door-sized gates can be installed in hallways, or at the ends of rack rows to prevent access to more restrictive areas of a warehouse or other parts of your facility. 3. Allow airflow and daylight into the warehouse. Airflow and sunlight play an important role when it comes to creating a healthier, safer and more ergonomic warehouse. A stale environment isn’t conducive to safety or productivity, so when it’s possible, allowing air into your facility is a very desirable goal. Folding gates allow fresh air and sunshine both to filter into the warehouse while maintaining access control. In 2014, a Northwestern study tried to quantify the impact of sunlight on workers that found a correlation between daylight in the workplace, increased physical activity, and increased quality of life. Employees with windows and natural light in the workplace received 173% more white light exposure during work hours and slept an average of 46 minutes per night than employees who did not have natural light in the workplace. This translates into more productivity, fewer errors, less product damage and happier workers overall. If a warehouse is looking to increase daylight in the building, folding gates are a great option. They allow light and air from outside into the dock area and allow access while securing the opening. Warehouses typically have high ceilings, vast storage areas, and near-constant movement. Natural ventilation can help maintain good air quality, which is something the open grid design of folding gates provides without compromising security or accessibility. For example, a gate can be installed in front of a dock door to offer security when the door is open during the day. 4. Maintain visibility in to and out of the warehouse. At a loading dock, being able to see outside helps workers and supervisors better understand current conditions. Employees can see when trucks are approaching, speak with vendors or other visitors, and understand the situation in the dock area for traffic management, while still maintaining security. This may also help reduce accidents in the staging areas and parking lots outside a shipping area. The balance between security and accessibility is what makes folding gates such an appealing option; they provide an affordable solution for security without compromising accessibility. Opening the gates takes just a few steps and is unobtrusive when folded into a tight stack and rotated out of the frame or opening. Folding gates allow for quick access and egress — both safety priorities. Folding gates come in an array of sizes and strengths to suit any purpose. What’s the right gate for your warehouse? Take a look at these additional resources to find out more about our folding gate options.